Classic muscle-building lifts won't serve you if you're letting the weight drag you around like a rag doll. Get control of the situation and earn the mass you've been craving! Too many people only want to know "what" to do. They scour magazines and websites for the details about reps, sets, rest, stacks, and meal plans, looking for a secret code that doesn't exist. There is no "what" without the right "how" and "why." In my last article, I dug into the "why" and discussed tried-and-true principles to structure your training around. Now I'm going to tear deep into how you can get the most out of some classic movements that every bodybuilder knows. Want to know how to get the most out of upper-body mass-builders like the bench, chest, and shoulder presses? It's all about studying these movements from all the angles, not just moving weight around. Better pressing starts all the way on the other side of your body. Let me show you what I mean. Want to know where effective presses start? It begins in the lower body, with a firm foundation. I talk about this quite a bit on my website. If your foundation is less than ideal or just flat out wrong, everything else you do from that point on will be too. This applies to any standing or seated exercise, so I'm talking about pretty much everything you do in any given workout. On the other hand, if you master a rock-solid base, you can focus on executing the movement you're doing and take your form to higher and higher levels. Your feet need to be one with the floor, firmly and evenly planted, almost like they're in cement. Look around the gym (or maybe just look down), and you'll see guys who are up on their toes, back on their heels, or balanced unevenly on the outside or inside of their feet. For presses, I recommend placing them slightly wider than shoulder-width. Experiment with your foot positioning now that you know how important it is. Your feet being just an inch too narrow or an inch too wide can make a huge difference in how you perform the set. Don't lock out your knees. They should be bent enough for buoyancy and flexibility, but firm. Visualize it this way: If someone were to give you a light push, you should be able to maintain your position without having to fight to keep your balance. Your hips shouldn't be tilted either forward or backward. This is a key point for many people because of their less-than-ideal everyday posture, and it is essential for stability. A lot of your strength comes from your lower back, so make sure that your back is arched—never slouched—and that you lock it down nice and tight. I know some guys feel more comfortable looking off to the side, but this can be unnecessarily distracting and it puts your body out of alignment. Keep a straight line, running from the bottom of your spine to the top of your head, with your chin up and eyes facing forward. Perform a mental check-off of each of these points before each lift, since you'll want to just jump in and start pounding out the exercise. You must practice this discipline each and every time until it becomes a habit. Within two or three weeks of consistently setting up this way, you'll start executing it without any thought. But you have to put in your mental rep work first. If you've got that down, let's put the same type of scrutiny on how you perform four classic pressing movements. Graduating from simple flat bench presses to next-level chest training begins with finding the right arm angle for your particular body. This angle is different for everyone, but once you find yours you'll begin to engage your chest like never before. This is something you'll need to focus on and figure out yourself. But you can't do that until you know how important it is. Rather than just go "wide" or "narrow" because someone told you it's what to do, start by paying attention to what you do naturally. Here's a trick I like to use to find the sweet spot. Rather than just go "wide" or "narrow" because someone told you it's what to do, start by paying attention to what you do naturally. When you place your hands on the bar preparing for the bench press, pay special attention to your elbows. Are they tucked right against your body, or are they flaring out at a wide angle? The answer probably lies somewhere between the two. Start from this most comfortable position and experiment with incremental changes until you find an angle where you feel it the most in your chest. Another next-level tip for the flat barbell bench press is to stop trying to move the bar straight up and down. Now, I know it looks like that's what the most experienced guys in the gym are doing, but take a closer look. The movement should have a slight banana-shaped arc to it, so the bar is slightly closer to being above your chin at the top of the movement than it was at the bottom. To repeat, this should be a very slight arc—maybe an inch or so from the bottom to the top of the movement. You'll know you have the arc right when you start feeling it in your chest. And of course, remember to control the weight on the way down. The chest press is an interesting case study because many people simply assume they're doing it correctly, but meanwhile the path of the weights tells a different story. So my next-level tips here may sound basic, but they ask you to stop taking this important movement for granted and re-examine what you're doing. First off, the angle of the bench is extremely important. It should be the slightest angle possible, probably the lowest setting on the bench. I would say the angle should be no more than about 15 degrees. Any more than that and your shoulders will be heavily involved too, which diminishes the results for your chest. When you're doing this movement it shouldn't be straight up and down when viewed from the front or back. Move at a very slight angle so your hands meet at the top of the movement, and the dumbbells are wider at the bottom than the top. I call it an "A-frame" motion. As the weight gets heavier and the dumbbells try to flare outward, concentrating on the "A-frame" will keep your form in line. Otherwise, you once again risk working the shoulders too much, as well as potentially injuring yourself. Just as with the flat bench, move in a slightly banana-shaped arc when viewed from the side. When people think they're moving the dumbbells straight up and down, they're almost always actually letting the weights drift forward, losing chest stimulation all the way. Control the weights; don't let them control you. While I'm on the topic of control, I'll remind you again to control the weight on the way down. Never let gravity do any work without a good fight from you! As with the chest press, try to avoid starting from more than a 15-degree angle on the incline bench. I know this can be tough, because many incline bar benches aren't adjustable. Try to avoid starting from more than a 15-degree angle on the incline bench. So if you need to, scoot forward on the bench and maybe even lift your back off the seat so you can find the right angle. In this case you might have to think outside the box in order to position your body at the correct angle and feel the proper stimulation in your chest. Another crucial cue for this movement is to start high on your chest. If you are shooting to place the bar to the middle of your sternum like you do during a flat barbell bench press, you're going to incorporate way too much of your shoulders. The bar should just barely miss your raised chin when exploding upward. When you bring the bar down, it should just barely clear your chin again. 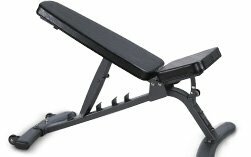 Stop me if you've heard this one before, but the incline bench is yet another press that appears to be a strict vertical movement, but isn't. If you guessed that I'm going to demand that the weight travel in an arc shaped like a certain piece of yellow fruit favored by infants and apes, you're right! All right, enough with trying to keep the shoulders out of our presses. Now we're going to bring them in big-time! When you're doing the dumbbell press for shoulders, don't just focus on moving the weight from point A to point B. If you do, your arms and the dumbbells will naturally drift forward on the way up. Consciously fight this tendency by lifting up and backward, and you'll really start to feel a challenge to your shoulders. This is also where that tight, locked-down lower back I mentioned earlier comes into play. In fact, it's crucial to protect yourself from injury. That's the side view. Now let's move it back to the front for another angle. Keep the dumbbells as close as possible to the center of your body, what is known as the axial skeleton. Don't let them start angling outward as they get heavy. Once again, if your goal is to push them straight up, you're probably actually angling outward without realizing it. Combat this by using a tight A-frame angle I discussed earlier: wider at the bottom, narrower at the top. Also, whether you're doing dumbbell presses or military presses, here's a grip technique that can make a huge difference for you. As you grab that bar and push up, all of the grip pressure should be focused between the center of your palm and inward toward your thumb, as if you're using the inside of your thumb to bend the bar away from you. You should almost be able to lift your pinkie and index finger off the bar. Traditional thinking has you putting the grip pressure evenly throughout your hand. However, this simple cue will cause you to feel it more in your shoulders than ever before. Turn up the pressure to get on the path to new growth!